Is Vacation Good For You? My family is finishing a fantastic week-long vacation in the Smoky Mountains of eastern Tennessee. We highly recommend Gatlinburg and Pigeon Forge for any family with small or medium-sized children, couples, honeymooners, or anyone else who is looking for a family-friendly destination with plenty to do and see. I haven’t had a weeklong vacation in quite some time. My partners, unfortunately, take even less vacation time than I do. There is evidence that going without dedicated downtime increases burnout in all professions. We all need time away! This week I was forced to be more “unplugged” than I really wanted to be, because our rental condo had spotty-to-nonexistent wifi service. I missed my midweek blog post (sorry for that, guys!) and had to hang out at Starbucks with my iPad to get out an email for Earth Day. Sigh. However, in spite of missed emails and phone calls and Facebook posts and tweets, it was good to get away and spend some time with my family. Before I tell you why vacation is good for you, let me tell you about our trip to Gatlinburg and Pigeon Forge. Terry is so approachable, down-to-earth and genuine. 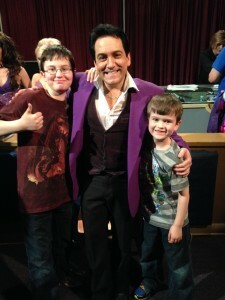 He truly loves kids, loves teaching and (after over 5000 shows in almost 18 years performing) is the consummate professional. He was happy to pose for pictures too! Another highlight of the trip was finally getting to Ripley’s Aquarium of the Smokies. 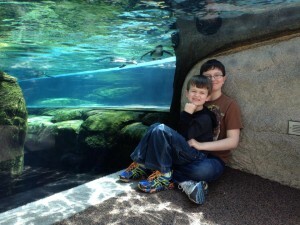 We’ve been to Gatlinburg and Pigeon Forge 3 times and this was the first time we went to the Aquarium. It was fantastic! 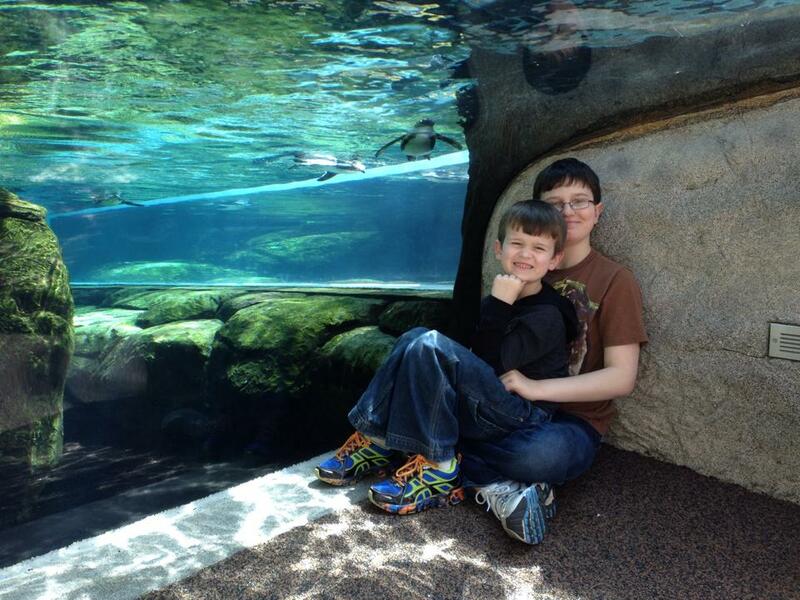 The penguin exhibit was my favorite. My mom and I both love penguins. 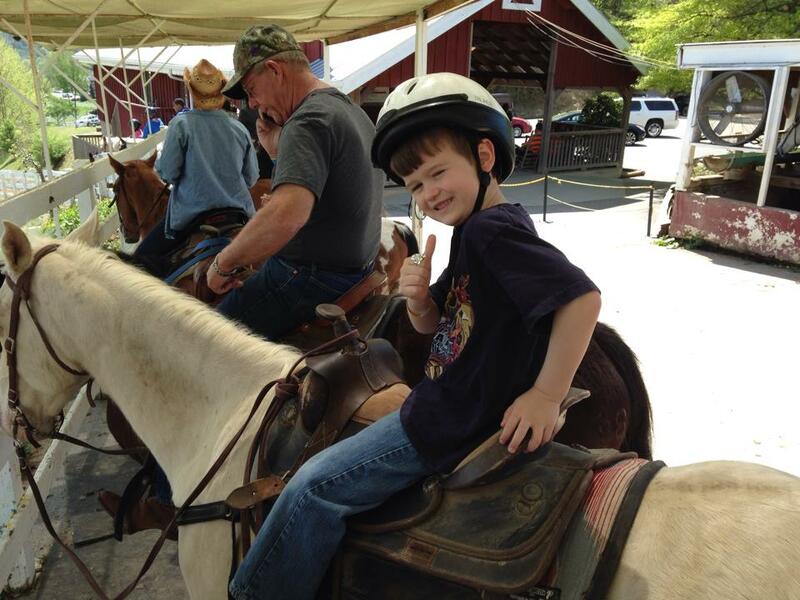 My favorite activity this trip (and actually my favorite on all 3 of our trips to Tennessee) was riding horseback. We tried a new stable this time, Five Oaks Riding Stables, which also offers ziplines and a ropes challenge course. Next time we’ll try the other attractions. We ran out of time! My boys are getting to be good little horsemen! 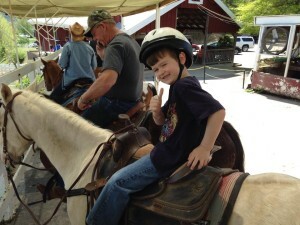 Nick rode by himself this time, not on a lead rein, and did great. I was given a horse named Doc (to everyone’s amusement). So is vacation good for you? Yes, absolutely, and I’ll tell you 3 reasons why it IS good for you. 1. Leave work behind. It’s good to leave the stress of your job behind and decompress for a little while. Even though I love my job I can tell when I go back to work I will be much happier and less prone to let the little irritations get under my skin. 2. Spend time with family. It’s easy to take those you love for granted when you’re running from work to activities to household chores. When you get away for a little while, it’s easier to reconnect and get to know each other again. 3. Meet new people and see new things. It’s easy to get stuck in the same old ways of thinking, the same old ways of doing things when you don’t take a chance to get away. Do you have to take a whole week and drive 8 hours away from home to get the benefits of a vacation? Absolutely not! An overnight in Amish country or tenting out at a campground will do the same thing. Just make sure to look around you with fresh eyes, and focus on the people you love. QUESTION: Where did you go on your last vacation? Let me tell you something right now. Dying is NOT the worst thing that can happen to you. Dying is PART of living. In many ways it is the part that makes the living most precious. Life doesn’t last forever. We each get only so many days to make our mark on the world. So what IS the worst thing that can happen? For me, it would be living trapped inside a body that I couldn’t control, unable to communicate with those around me, unable to contribute to my family’s and society’s well-being. If I were a worst-case-scenario type of person, that thought would keep me up at night. I’ve had patients in the hospital and the nursing home this week that have been trapped. They have been unable to communicate with us, their condition has been worsening with no signs of getting better, and their families have been struggling with deciding what to do. I can’t imagine the pain of watching my Mom or Dad (my family’s beloved Nana or Pa) sick to the point of death and being asked to make life-or-death decisions on their behalf. I’m fortunate that my parents and I have discussed their wishes and they have created a Living Will to document their wishes should anybody have to make decisions for them someday. There was an excellent article published in the Wall Street Journal a few years ago about how doctors die differently. We tend to forgo a lot of the aggressive treatment that our patients get, the same treatments that we tend to recommend for them. We tend not to want a lot of muss or fuss. We certainly don’t want to spend our last days in a hospital. Why are we as a society so afraid of death? As obsessed as Hollywood is with violent death, you’d think we’d be accustomed to it. The truth is, though, that many of us are phobic when it comes to the thought of our own death or the deaths of those we love. We refuse to think about it, talk about it, or plan for it. Everyone and everything that lives, dies. This weekend is Easter, the memorial of the death of Jesus Christ. Even GOD died! The simple fact of death is not a tragedy. How can something that happens to every living thing on Earth be tragic? It’s part of living. This doesn’t mean that we shouldn’t be afraid. It’s normal to be afraid to die. Even Jesus was afraid. He begged and pleaded to be spared. He didn’t want to die. He didn’t want to suffer pain. He didn’t want to be embarrassed and humiliated. He didn’t want his friends to leave him or to have them have to watch him suffer and die. These same fears that Jesus experienced are the same ones that we experience when we are confronted with our own mortality. We don’t want to be in pain, suffer indignity, be alone, or watch our loved ones suffer with us. When I take care of someone who is terminally ill, I see the same large drama enacted at the first Easter two thousand years ago played out again small, with someone who is frail and fallible but no less a son or daughter of God. It’s normal and healthy to be afraid of dying. It’s NOT healthy to refuse to think about it, talk about it, plan for it, and think about what you would or would not want done if you were sick and unable to talk to your doctors. Make sure your family knows what your wishes are, and fill out a Living Will if you can. Your doctors desperately want to respect your wishes, but you have to let us know what they are. It is very important for scientists to discover viable ways of preventing Alzheimer’s disease. After all, we are spectacularly bad at treating it or slowing its progression. As a doctor that provides care to nursing home patients I’m very practiced at taking care of Alzheimer’s patients. Almost worse than the actual memory loss, personality changes, suspiciousness and delusions is the pain the family members suffer as they watch their beloved mother, father or grandparent slowly fade away and become a stranger. CAN we prevent Alzheimer’s disease? Well, I found some research that suggests there are things we can do to reduce the risk. First of all, Alzheimer’s disease is a chronic, progressive, ultimately fatal degenerative disease of the brain. Patients lose their short term memory and then gradually lose older memories as well. They lose the ability to safely manage complex tasks like driving or balancing the checkbook. They also often become suspicious of family members and suffer from delusions (“My daughter is stealing from me.”) and may wander away from home and be unable to find their way back. It is a horrible disease. Alzheimer’s disease becomes more common as we age. It’s estimated that 3-10% of patients over 65 have it, and it rises to 30-50% of patients over 85. It is the 4th leading cause of death for patients over 75 (after heart disease, cancer and stroke). Billions of dollars are spent on direct and indirect costs of managing Alzheimer’s disease. One of the most interesting facts about Alzheimer’s disease is that since it usually shows up at the END of life, if we can DELAY its onset fewer patients will get it. It is estimated that if we could delay its onset by 5 years, it would become about 50% less common. So how can we delay and prevent Alzheimer’s disease? First, it is important to understand that there are NO medications that prevent Alzheimer’s disease. While many, many scientists are furiously researching ways to decrease the risk of Alzheimer’s disease, it’s fair to say there are no proven methods. However, there is some evidence that three things can help. Older adults who stay active and engaged in their community seem to have a lower risk of Alzheimer’s disease. Exercise also seems to decrease the risk. Adults who were more physically active had lower risks of dementia. Older adults who suffer with obesity, diabetes and the metabolic syndrome have a higher risk of Alzheimer’s disease and other forms of dementia. Staying lean not only reduces your risk of heart disease, heart attack, stroke, and cancer, it also helps you keep your mental faculties. Want to see what I recommend to my patients who need to lose weight? Check this link here. Alzheimer’s disease seems to be increased in patients under chronic inflammatory and oxidative stress. Supplements that decrease inflammation and have antioxidant activity seem to decrease the risk of Alzheimer’s disease, although much more research is needed. Selenium, vitamins C and E, transition metals, vitamin D, B-complex vitamins, and omega-3 fatty acids have all been mentioned in connection with decreasing the risk of dementia. You can check here to see my supplement recommendations for specific groups of people. So what should you do, if you want to decrease your risk of Alzheimer’s disease and stay sharp into your ripe old age? In short, stay active and engaged, exercise regularly, eat right and stay lean, and take a well-designed supplement regimen that contains plenty of antioxidants and other supplements that decrease inflammation.